The free flow of information in ICT networks of enterprises and the high availability of many resources favour various type of threats. The lack of appropriate safety policy and appropriate safeguards frequently results in serious consequences, including the loss of data and resources, decrease in work efficiency, huge material losses. The solutions of Enigma protect enterprise information, minimise threats, monitor and react to incidents of network safety inside and outside an organisation. The Digital Archive System allows to comprehensively manage documents in each form – pictures of documents (scanned paper documents), electronic documents (text files, electronic mail, multimedia), paper documents, and their flow within an organisation. The system makes it possible to record and group documents into groups, series/subseries and to classify them as single objects. Due to its internal architecture, it makes it possible to create an association between documents and stored objects. Entitlements in the system are based on roles, which makes it possible to flexibly create entitlements. Depending on entitlements, a user’s interface – which displays options available for a person having certain entitlements – is dynamically changed. Due to the implementation of PKI, it guarantees the safety and invariability of the stored and shared archival documents and the full accountability of employees. Act of 14 July 1983 on the National Archival Resource and Archives. Order No. 13 of the Central Directorate of State Archives of 29 June 2011 on digitisation. Order No. 4 of the Central Directorate of State Archives of 1 February 2013 on the organisation of making archival materials available in the state archives. Decision No. 3 of the Chief Director of State Archives of 10 January 2007 on the safeguarding and protection of the archival resource of the state archives. ISAD(G) – General International Standard Archival Description. ISAAR – International Standard Archival Authority Record of corporate bodies, persons and families, used for the standardised description of an entity generating and gathering files, strictly related to the ISAD standard. The modular structure of the Digital Archive System allows high flexibility and possibility of adaptation to the volume of resources. It possesses an advanced search of information on the stored archival materials. The search uses metadata introduced in the process of description of archival materials, as well as other information e.g. in the form of OCR text or additional descriptions of archival units. Searching depending on the profile and entitlements of a user. Searching of information using many search questionnaires e.g. topic-based/subject query, personal query, ranges of reference numbers, structural browser. Searching of descriptions related to archival units. Searching of descriptions of files. Searching in a personal index. Access to context data (group, subgroup, series, subseries) from the level of a description of an archival unit and through a structural browser. Searching of issues, cases, problems mentioned in archival materials, as part of a topic-based/subject query. Searching of persons listed in a personal index, as part of a personal query. Searching of a topic-based/subject query in two ranges: simple and advanced searching. A search which makes it possible to create model files allowing to search information related to a basic entry (e.g. Polish Pope, it will also find Karol Wojtyła, John Paul II, JPII). Searching in the scope of a location field is supported by a model file of geographical names. The archival unit description module is introduced by users or through automatic mechanisms. Due to the key importance of information introduced at that stage, the system possesses mechanisms related to the control of the introduced data. The process of verification of work and introduced data is used as part of the system. Due to such solution it is possible to transfer knowledge from employees verifying data to employees introducing data, and the introduced data is of high quality. Introduction of a description of an archival unit, audio materials, photos and video materials. Introduction of descriptions of files and record aids. ODescription consistent with ISAD(G), ISAAR and rules accepted by the Central Directorate of State Archives and Polish law. Use of multi-level dictionaries (possibility of adding and editing dictionaries depending on the possessed entitlements for local and global dictionaries). Description at the level of a personal index. Possibility of data export (e.g. public archival inventory). Reporting of activities related to an archival description and the amount of information introduced by the system users. A module of acquisitions and withdrawals makes it possible to record the received and withdrawn archival materials in an organisation. Archival materials may be received in various forms – in a paper and electronic form. Withdrawal is registered when there is a record in the book of acquisitions or in the register of groups or archival collections. The system automatically numbers withdrawals (creates a book of withdrawals). Register of withdrawals (book of withdrawals). The warehouse service module makes it possible to fully monitor warehouse management. It makes it possible to define warehouses, warehouse space, rack, stockbook, shelf, drawer, item etc. It allows to automatically assign values to a topographic inventory which indicate the place of storage of archival units in archival warehouses, for a number of archive reference numbers, according to a recording order of transfer and receipt lists or archival groups (collections). List of determiners of a topographical inventory for the indicated string of reference numbers. List of strings of reference numbers stored in individual archive rooms. List of free warehouse space in individual archive rooms. Create, edit and remove descriptions of conservation activities for individual archival reference numbers. Prepare statistical registers picturing the specification of conservation activities for individual strings of reference numbers and archival warehouses. Determination, editing and removal of information related to climate parameters of rooms in which archival materials are stored. Possibility to introduce conservation recommendations for each archival unit. Registration of activities involving sterilisation and disinfection of documents. The safe electronic mail system – KryptoMail is a modular software package used to protect the confidentiality and authenticity of information sent in the electronic mail system which uses strong cryptographic mechanisms. Using the electronic signature function allows to obtain the integrity and authenticity of all information, as well as to unambiguously verify the sender’s identity. Due to it, only the sender and the indicated recipients have access to the content of a message. Implementation of the electronic mail protection takes place without changing the habits of a user. Depending on the required level of safety, the system is protected by a password or microchip card. The system works both on desktop computers and mobile devices (including smartphones) and may be installed in all organisations, regardless of their size. intelligent protection against spam and phishing. cooperates with any client programmes supporting SMTP, POP3 or IMAP protocols. ensures the continuity and integrity of all messages stored. A secret office within general meaning is a place where documents containing classified information with various clauses of secrecy are received, registered, stored, sent or released to authorised persons. A secret office is a basic element of safety of an organisation, company or corporation implementing strictly defined, very specific tasks related to the processing of classified information. 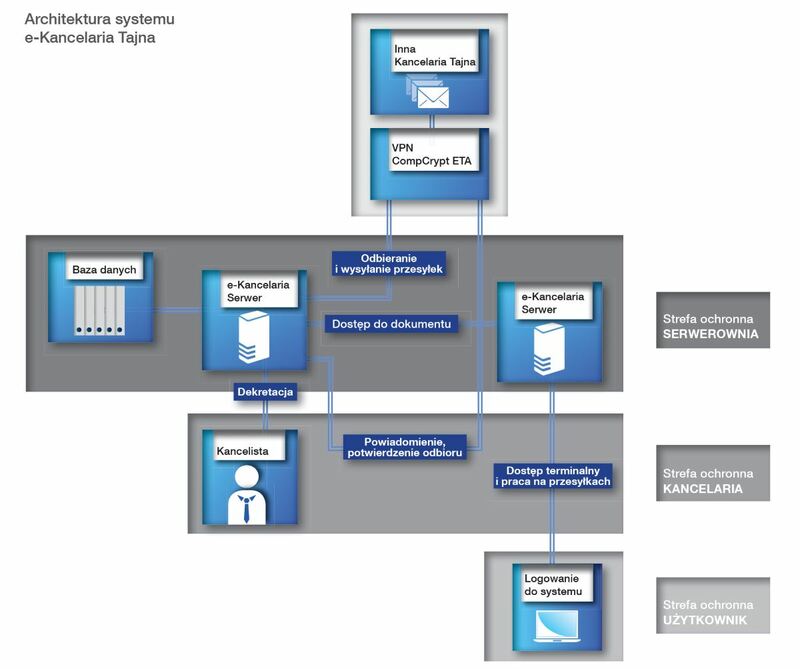 The Secret E-Office (E-Kancelaria Tajna) system developed by Enigma, constituting an extensive IT system, fulfils all functions of a classic secret office and, at the same time, improves the process of registration, distribution and storage of classified information, ensuring the required level of its safety. The system is not only limited to electronic recording and printout of documents or ensuring their traditional circulation in an organisation unit, but it is also safe electronic exchange of classified documents between many offices, e.g. between company’s headquarters and its regional branches – using safe and encrypted network connections. A user logs on to the system using a Certificate issued by the Certification Centre. Using an access application after identification, authentication and verification of the level of entitlements, a user obtains access to documents. All documents are signed with the use of a qualified certificate and automatically provided for registration in an office. After authentication with a qualified certificate using the “e-office Clerk” (“e-kancelaria Kancelista”), a clerk obtains access to the management of logs, registers, establishment of files, sharing of documents. The e-office server plays the role of the “system core” responsible for the storage and control of access to classified documents. The submitted documents are protected against unauthorised access of third parties. A very important element of the system safety is the control of access to documents containing classified information with the use of cryptographic cards and PKI infrastructure. The whole exchange of correspondence in the office takes place with the use of encryption devices – CompCrypt ETA, having a cryptographic protection certificate issued by the Internal Safety Agency, allowing them to process classified information, including information with the “confidential” clauses. ProtLog is a system used for the safe gathering and storage of logs of applications and devices. Due to the use of cryptographic mechanisms of an electronic signature and time markers, the system ensures the possibility to detect and identify each introduced change by the verification of coherence of logs which have been archived with the source ones. It may support any number of sources and events of any form. ProtLog is a system intended for mission-critical applications. Individual components of the system have been structured in such a way so as to ensure the maximum level of availability and support the existing reliability increasing technologies. As interest in the processing of significant amount of telecommunications data, mail data and internet data grows, Enigma has created the e-Gida database system facilitating the viewing, processing and generating of reports from the acquired data. A complete set of data is processed by the central server. The system is intended for the processing of classified information with the RESTRICTED clause.